The dramatic increase in the detection and diagnosis of papillary microcarcinomas has resulted in a huge increase in the number of thyroid cancer surgeries being done for very low-risk disease. 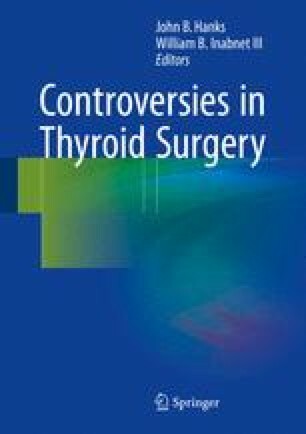 While thyroid surgery is the cornerstone of the management of clinically significant thyroid cancer, the very low-risk nature of papillary microcarcinoma and the successful use of an active surveillance management approach by our Japanese colleagues have caused many clinicians and patients to question whether or not an immediate surgical approach to initial management is warranted in all cases. In this chapter we will review the risk factors associated with disease progression in papillary microcarcinoma, the expected outcomes after surgical resection, and the outcomes associated with active surveillance. Finally, we will provide clinical guidance with regard to proper selection of patients for either an immediate surgical management approach or an active surveillance observational management approach to very low-risk thyroid cancer. National Cancer Institute (no date) Surveillance, Epidemiology, and End Results Program (SEER). SEER Stat Fact Sheets: Thyroid Cancer. Available at: http://seer.cancer.gov/statfacts/html/thyro.html. Cooper DS, Doherty GM, Haugen BR, et al. (2009) American Thyroid Association (ATA) guidelines taskforce on thyroid nodules and differentiated thyroid cancer. Thyroid. 19(11):1167–214. doi: 10.1089/thy.2009.0110.